Is the Jobview service “live” on the Internet? Jobview kiosks and software do have internet access but that access is controlled by the Jobview application, not the user. The internet access is used to redirect the Jobview application to an approved website or domain to enable the user to meet a specific requirement such as registration or to apply for a job on an employer website. Jobview Corrections is available in both a secure and non-secure version. The Jobview secure version does not have access to the internet. The kiosks can access the Jobview corporate network using a Virtual Private Network (VPN) wireless broadband connection. The connection is used by the Jobview application to retrieve additional job information from our central job listing database as it is requested by the user. The user does not have direct access to the corporate network and they have no access to a keyboard; they only see and interact with what the Jobview Corrections application presents to them. Are the kiosk users tracked? Each non-secure kiosk or Jobview equipped workstation captures a wide variety of user statistics including touches, prints, emails, text messages, applications, category touches, ad views and much more. All of this information is made available to the service provider in report form. Can a jobseeker store their personal information on a Jobview service? No registration or other personal information is stored on the service. How often are job listings updated? 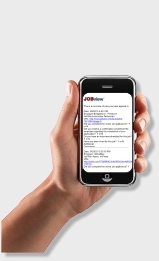 Jobview listings are updated daily for all versions of the product. Is there a limit to the number of prints and applications that a jobseeker can print or send? Users can view, print, email, text message, and request application assistance for as many jobs as they like at no charge. The Jobview Corrections secure version does not support the application, email, and text message features. Where are Jobview kiosks and software equipped workstations located? Jobview kiosks and software equipped terminals are located in Workforce Centers, Libraries, Colleges, Correctional Facilities, Reentry Housing and other public-service locations – all places where people actively look for work. Who is responsible for maintaining the kiosks? Jobview is solely responsible for all maintenance and upkeep of the kiosks unless other arrangements are requested.